The Siberian Husky – Cool Facts About this Majestic Breed! Baby, it’s cold outside, so what better time to have our breed blog about the Siberian Husky? We may think the weather outside is frightful, but Huskies love this time of year and we want to give you some very interesting facts about this snow-loving breed! 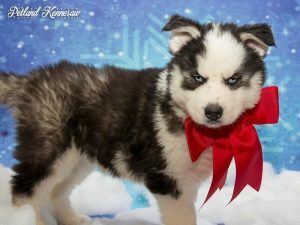 Petland always has Siberian Husky puppies for sale, check them out on our available puppies page! Running is in the Husky’s blood, obviously. The Siberian Husky is believed to be the closest breed of dog to the original Chukchi dogs. The Chukchi dogs belonged to the semi-nomadic Chukchi people of Siberia about 3,000 years ago, who sought to breed the ideal sled dogs. They wanted a breed of dog that had the endurance to run a hundred miles a day, extremely high tolerance for cold and be able to carry heavy cargo on very little food and warmth. The Husky can regulate its own metabolism, say what? Staying true to what they were bred for, Huskies often run long distances on very little food. But if a human attempted this, our bodies would start to use glycogen and fat stores, which would fatigue the body quickly. However, Huskies can burn through calories and never touch these stores, regulating their metabolism and avoiding fatigue. Humans just have no idea how they do it! Those eyes, that coat and those colors! Huskies have what’s called a double coat and it is uniquely suited for their origins in frozen Siberia. The undercoat is very short and keeps the body warm and insulated, while the overcoat is very long and water-resistant. Even their eyes are suited for winter tundra! Because of their almond shape, they can squint to keep out snow and ice, but still see where they are going. The piercing blue that you see so often is not, in fact, due to any gene malfunction like in all other dogs with blue eyes, but unique to Huskies alone. And their color patterns are some of the most beautiful of any dog breed and arguably one of the most identifiable! We certainly hoped you enjoyed these interesting facts about the Siberian Husky, we certainly did! Make sure you keep warm out there, you don’t have all the advantages the Husky has when dealing with freezing weather! Want to find out more about the Siberian Husky puppies for sale in our store? Check out our available puppies page to see all of our cuddly Siberian Husky puppies for sale! The German Shepherd Dog – Interesting Facts About this Honorable Breed! Okay, ladies and gentleman! The holidays are almost upon us and there’s just enough time for another one of our breed blogs before Christmas! The breed we will be focusing on today is the fiercely intelligent and loyal German Shepherd Dog! Not only has this breed been a beloved pet of Americans for many years, it has even been number two on AKC’s most popular breed list in 2014! We love the German Shepherd (I mean, come on, have you seen those precious ears?) and we hope you enjoy the interesting facts below! 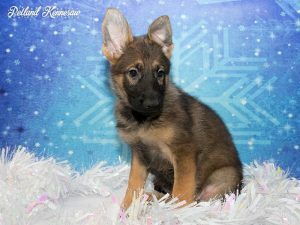 Petland always has German Shepherd puppies for sale! Surprise, surprise…the Germans standardized the breed, but wait, there’s more! The German Shepherd Dogs were big-time movie stars. Their heroism knows no bounds. The Fiesty Chihuahua – Interesting Facts about this Saucy Pup! This breed of dog is one of the most recognizable, due to its starring roles in Taco Bell commercials, movies like Legally Blonde and Geico commercials. But no matter what, this feisty little breed can make quite an impression on people! With famous past owners, such as Marilyn Monroe, it’s no wonder why this breed is one of America’s favorites! Read along to find out more about the Chihuahua! 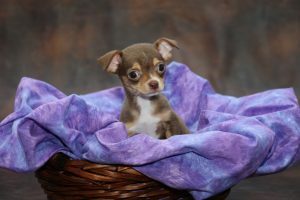 Petland always has Chihuahua puppies for sale! The Chihuahua goes back how far?? The Chihuahua is actually the oldest dog breed from North America. Their ancestry can be traced back to the Techichi breed in ninth-century Mexico. The Techichi dogs were revered as mystically powerful by the Aztec and Toltec cultures where they were kept as pets. They still carry the name of the state in Mexico where these cultures flourished, the State of Chihuahua. The Chihuahua actually holds the Guinness World Record for smallest dog breed. Miracle Millie, the record holder, is a diminutive 3.8 inches tall and was born in 2013. While most Chihuahuas never get close to being that tiny, the Chihuahua is one of the smallest dog breeds. Because of their size and that the breed has no inherent health problems, they tend to live longer than any other dog breed. The Chihuahua was one of the first breeds to be registered with the AKC back in 1904. They actually have the widest variety of colors and markings acceptable to the AKC in show rings and are split into two groups, smooth-coat (shorthaired) and long-coat. Despite the Chihuahua’s long history with the AKC, the breed has never won a Best in Show at Westminster. Well, there’s always next year! Look at the big brain on…wait, the Chihuahua? It’s true, folks! Relative to their bodies, the Chihuahua has the biggest brain in the dog world! Because of this, they tend to be quick-witted and very easy to train. However, that big brain sometimes causes them to have a willful personality and they need a firm hand in housebreaking. And as dogs of the desert, they are not happy with going out in the cold or the rain. But really, who does want to go out when it’s cold and rainy? 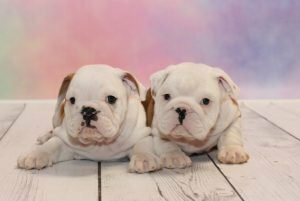 The English Bulldog – Fun Facts About this Snorty Breed! Welcome to the next segment of our very popular ‘spotlight on breeds’ blog series! Our very special breed that we’ll be learning about today is one of the most recognizable breeds in the dog world, the English Bulldog! Even though you might know this breed’s physical characteristics, do you know their history? Read along to find out! Here at Petland, we always have English Bulldog puppies for sale! 1. What’s the ‘bull’ in bulldog? The English developed the bulldog breed in the 13th century. As the name suggests, the bulldog was bred specifically for bull baiting. While this practice was eventually banned in 1835, the bulldog retains many of the same traits as the original bulldogs, the short snouts, stocky bodies and loose, wrinkly skin. After the banning, the bulldogs of old had to find a new purpose in life. The breed almost went extinct, but lovers of the bulldog were determined not to let this happen! They instead bred a bulldog that had a kind and gentle demeanor that could serve as a perfect companion. Keeping this wrinkle-faced breed going is not as easy as one would think! Because of their large heads, almost all bulldog puppies are delivered via c-section. And due to their tiny backsides, English bulldogs don’t do well in water, as swimming and keeping themselves afloat is difficult. They also do not take heat very well and can only be outside in the summer for small periods of time. Despite all this, the English bulldog has captured America’s heart as the fifth most popular dog in the country! 4. Root, root, root for the bulldog! We all know that England is very fond of their bulldogs, even going so far as to consider them the national breed. But the US definitely rivals that love for this squishy-face, snorty little breed by using it as the overwhelmingly popular school mascot. Across the country there are about 40 universities that cheer “Go, Bulldogs!” and that doesn’t even include smaller colleges, high schools or middle schools. Now that’s a lot of bulldog love! Want more information about the English Bulldog breed? Check out our breed info page! Want to find out more about the English bulldogs for sale in our store? Check out our available puppies page to see our English bulldogs for sale!